I’m a huge fan of mewithoutYou. Like their music, their album packaging unique and beautiful, and so it seems fitting that they be one of the first additions to my meager vinyl collection. 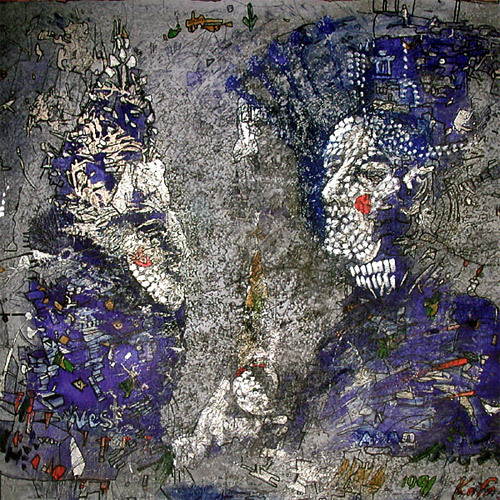 I looked up the artist from one of their album’s liner notes—where it was mispelled—and learned that Vasily Kafanov, a Russian born painter living in New York City, did the paintings for all three mewithoutYou albums and, interestingly, also collaborated with Billy Corgan for the Machina/Machines of God concept ablum artwork. In particular I appreciate the texture and detail of Kafano’s artwork which at times is so stricking that it appears as if the pieces are actually made using elements of wood and metal, rather than simply painted. Fortunately, the first two mewithoutYou albums are available on vinyl from the fine people at Gilead Media, and their most recent album Brother, Sister is likewise available at Burnt Toast Vinyl. I ended up choosing their 2nd album, Catch For Us The Foxes, simply because it is has the most vivid color palate which will make it more attractive framed on a wall. Next Post » What Makes Student Ministry Successful?